Healthy school lunches are causing a lot of grumbling among teenagers. Mrs. Obama is the target of a great deal of criticism for setting new Federal Standards which limit calories and protein and carbohydrates. 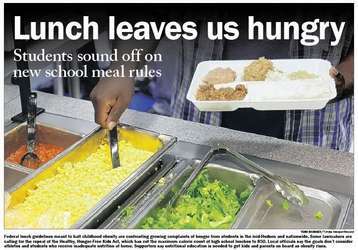 The USDA has responded to criticism by recommending the students eat a “snack” in the afternoon (see the article here). Funny, but this is nothing new. I know of a large group of Jews who complained to God Himself about their hunger. God responded with “Manna from Heaven”. Heavenly food, the food of angels, and still the people complained. They just did not get it. They were clueless to what God was giving them. I fear that many Christians are even more clueless to what God has given them in a book we call the Bible. Jesus made a statement that His listeners found incredulous. Even His disciples thought He was being a bit ‘crazy’. Yet what Jesus said is the key to understanding the Power of the Word of God! When the disciples heard Jesus say this, they said “This is a hard saying, who can listen to it?” And Jesus, hearing the internal grumblings of their heart replied, “Do you take offense at this?” Then he amazed them a bit more by asking, “What if you were to see me ascending to where I was before?” In other words, if your eyes were to be opened to see Jesus as Lord of heaven, and yes, Lord of Life, would my words be easier to accept and understand? As a Pastor I know that most Christians do not grasp the power of the Word of God. They do not depend upon the Word of Life to live their lives. They may know a few common verses, and may even read it now and then, but the Word of God is not the staple of their life, something which they cannot live without. On the contrary, the Word of God is strange and hard to understand to most “Christians.” Yet, we are to see the Word of God as the very source of our life. This is what Jesus said in John 6, that the Word of Christ must become your life, so much so that you must feast upon it every day. If the Word of God becomes your means of life, you will live indeed! The Words of Christ and His presence are to be as the manna which fell from heaven and provided sustenance for the Israelites for 40 years! God’s answer to grumbling was to show His glory. Jesus answer to grumbling was to ask them to see His glory. The Glory of God was the manna. The Glory of Christ was His Word! 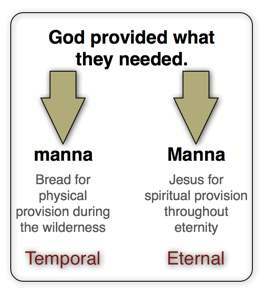 The manna was a type of the Word of Christ! A casual glance at manna said it was nothing special and not very appetizing. A casual glance at the Word of God says it is nothing special, and not very appetizing, especially the way Jesus described it. Yet both are the glory of God! We must chose to eat it and to live from it. Regardless of what it looks like or how it may seem, the WORD is life! We must make a decision to make it our life, our sustenance! If we do, we will see the GLORY of God! God says, “See, I have set before you this day life on the one hand and death on the other. Therefore, choose life!” (Deuteronomy 30:19). We can choose to value the Word above all else, or we can relegate it to an afterthought, something insignificant as far as our living is concerned. We must make the choice as to whether we gather it for our sustenance each morning. Matthew 6:31-33 Therefore do not be anxious, saying, ‘What shall we eat?’ or ‘What shall we drink?’ or ‘What shall we wear?’ For the Gentiles seek after all these things, and your heavenly Father knows that you need them all. But seek first the kingdom of God and his righteousness, and all these things will be added to you. 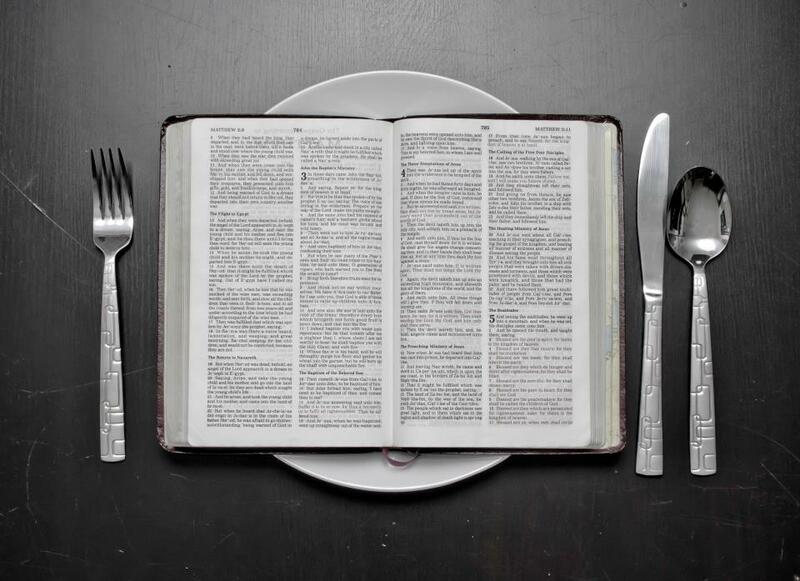 Why should we pray for our food each day when Jesus tells us not to be anxious about it? On the contrary, Jesus says to seek FIRST the Kingdom of God and His righteousness! The foundation of Kingdom Life is the Word of God! If you want to be a good citizen of the Kingdom of God, you must live by His Word! 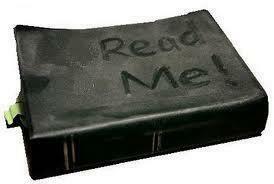 I will be so bold as to state that you cannot be a citizen of God’s Kingdom if you ignore the Word of God! 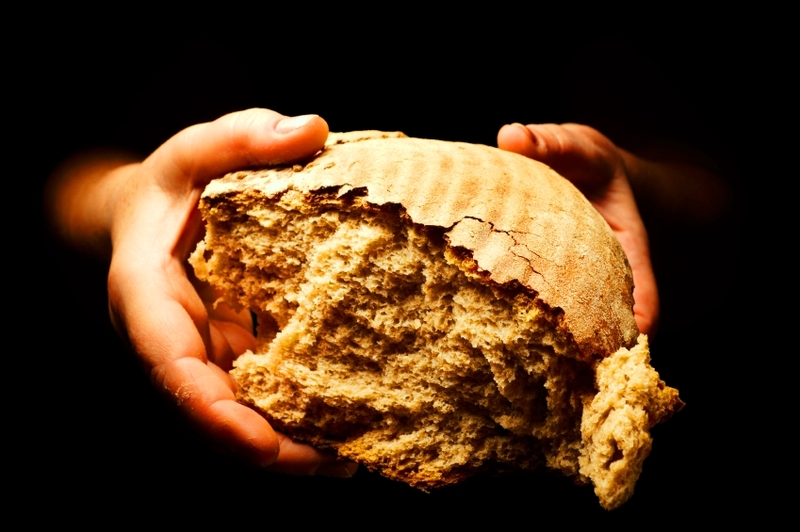 Jesus told the people that if they want to experience life, they must eat His flesh…“whoever feeds on me, he also will live because of me…” Jesus described himself as the “bread of life”. 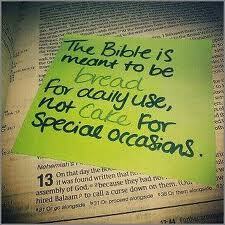 Bread is used in the Bible as that which is taken into the body and provides nourishment. Two types of bread are found in the Bible, leavened and unleavened. Leaven consistently pictures the corruption of sin (see 1 Corinthians 5:8). 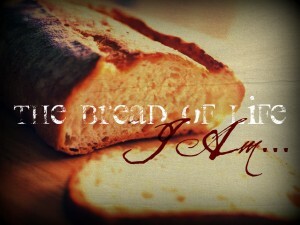 The manna which displayed the glory of God was symbolic of Jesus Christ, the “Bread of Life” (John 6:49-51). The Israelites had to respond correctly to this ‘gift’ from God to receive proper nourishment. They were to gather early before the sun became hot and it melted away, or they would go hungry that day, and perhaps another day if it was the day before the Sabbath. Peter said to him, “You shall never wash my feet.” Jesus answered him, “If I do not wash you, you have no share with me.” John 13:8. While it is true that we are indwelt with the Holy Spirit, He must be invited into our lives each day. He never leads without an invitation. God never takes control of our lives against our will. God wants us to choose willingly to believe and obey Him and seek a relationship with Him. If we do not chose each day to actively pursue God by partaking of His Word, we will slowly drift away from Him. We are easily and soon distracted by the cares of this world. Our eyes quickly fall from Him to the glitter all around us. We are easily distracted. This is why God often gets our attention through trials and other circumstances. However, God may not always strive with us if we continually fall away, smitten by our love affair with the world. Without the strength and power of the Word of God, we will soon find ourselves overcome by the wilderness of the world. We will join the fallen Hebrews. If Jesus realized that “I can of myself do nothing (John 5:30), what chance do we have to overcome this world in our own strength? Jesus exhorts us to seek His Bread each and every day! 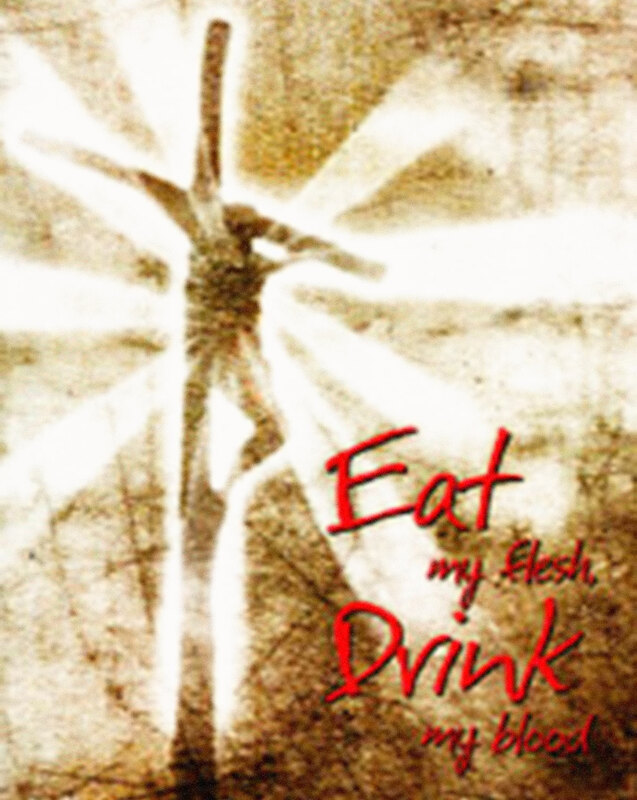 Feast on it daily and enjoy His LIFE! The disciples were reclining. They were at ease in their unbelief. They were more concerned about their bellies than they were their hard hearts. Jesus rebuked them for their unbelief and hardness of heart. They had refused to believe the report that Jesus was risen and alive! The disciples were allowing a fleshly thing to cloud a spiritual reality. Their focus on what was in the past hardened their heart to what was true in the now! This is true of Christians today. We feed our hearts on what God has not done or failed to do. Whenever we dwell on what has not happened, we foster the atmosphere for the spirit of offense and bitterness to arise and then thrive. When we dwell on what has not happened, we legitimize unbelief. We even excuse unbelief as normal. So we promote a sense of justification for not believing God. 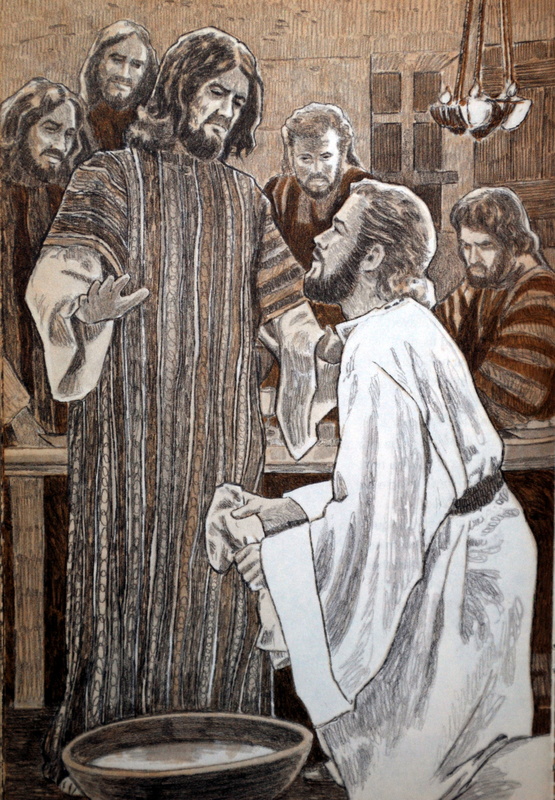 Jesus rebuked that attitude in His disciples. He rebukes that attitude now! That attitude and thinking has to die! Christians are at ease in their unbelief. They are reclining at the table of fleshly attitudes and thinking. While we feed our bellies, the world is crying out for spiritual truth that will change their lives. While we are content in our unbelief our neighbors are crying out for something worth believing in. The area of our greatest unbelief is in our prayers. So much of the content of our praying is for things we already possess in Christ, but fail to believe. So we labor to ask God for things we already have. We expose our unbelief through our boring prayers. We fail to ask God for things we do not possess because we fail to believe what God has given us. No wonder prayer is laborious and cursory to most Christians. No wonder there is a prevailing attitude that their prayers never reach the ceiling! 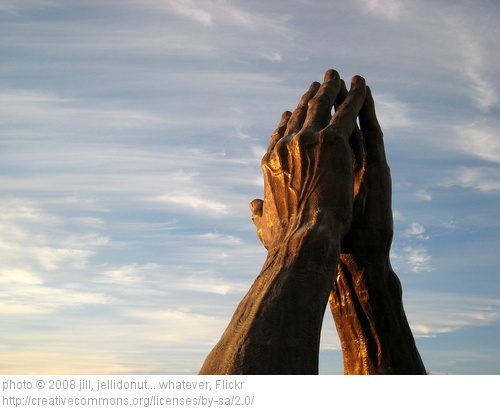 Our prayers are often exercises in unbelief! Churches are to be houses of prayer. The God purpose of prayer is to produce JOY in the experience of the believer. 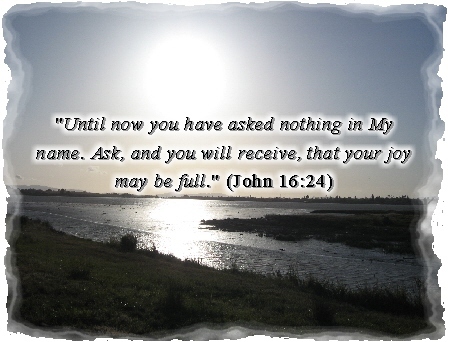 John 16:24 Until now you have asked nothing in my name. Ask, and you will receive, that your joy may be full. God wants us to feast on belief in the power of the Name of Jesus. Prayer is designed to be a breakthrough into His heavenly JOY! Prayer is the expenditure of belief in return for the heavenly currency. If we pray only for that which we already possess, we will never experience the breakthrough of JOY. We will never discover the riches of God’s heavenly currency! Never allow our prayers to contradict what God has already promised. 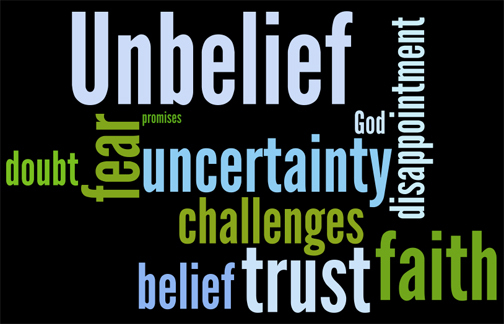 Our unbelief closes heaven’s resources to us. Closed heavens are between our ears. Failure to know JOY is between our ears! We limit our God because our unbelief does not want to take hold of His power and JOY, even when He is standing in front of us with outstretched arms! Paul saw Jesus, saw His power, and saw that power in His life. Paul experienced JOY even in prison, even in the stockades, even holding flotsam in the middle of the ocean. Paul’s eyes were opened and his heart was on fire for the realities of Jesus Christ! He could see the greatness of the power within Him, the same power that raised Jesus from the grave. Paul never reclined in unbelief after that vision. Our Vision should FIRE our Heart! Christians have no excuse for not seeing the same vision. The vision is there for all to see. If we fail to believe, the hardness of our heart is exposed. When Jesus was baptized, Matthew writes, “immediately he went up from the water, and behold, the heavens were opened to him, and he saw the Spirit of God descending like a dove and coming to rest on him” (Matthew 3:16). The picture is of the heavens being divided, rolled back, suddenly exposing the power of the heavenlies, and allowing the Holy Spirit to descend upon Jesus. Stephen saw the heavens rolled back and gazed upon the Glory of God and His Son. 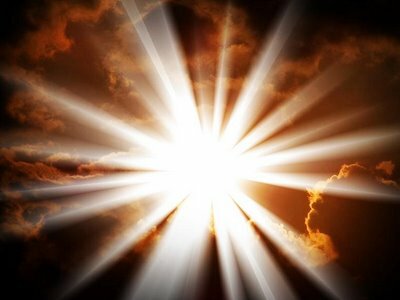 The truth is that the heavens have been opened to all Christians! 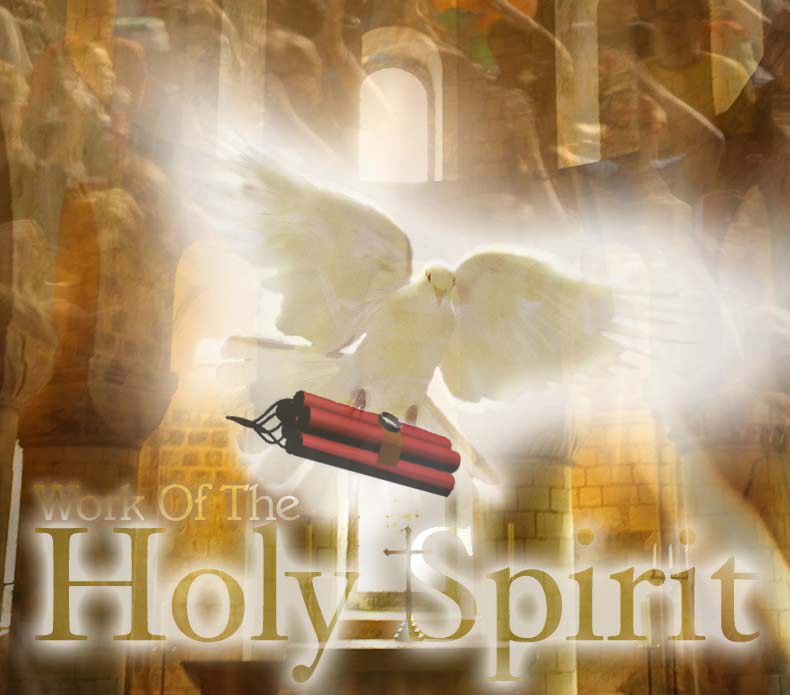 The Holy Spirit has been given to all Christians. The Glory of God is for all Christians. We have the Holy Spirit living within us, a gift from our Savior! Our Father is jealous for us to know the power of the Holy Spirit within us. He earnestly desires us to belief and experience His JOY! James 4:5 Or do you suppose it is to no purpose that the Scripture says, “He yearns jealously over the spirit that he has made to dwell in us”? We live under an open heaven. 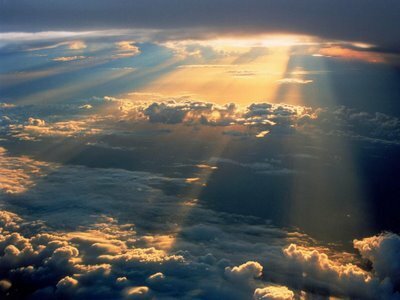 The heavens are rolled back revealing the Power of the Holy Spirit. The Spirit lives in every believer, but his POWER is not upon every believer. Luke 4:1 says that Jesus left the Jordan River full of the Holy Spirit. But he did not have the POWER of the Holy Spirit until He believed the Word of God in His confrontation with Satan in the wilderness. Are You Aware of the Power within You? The Holy Spirit is in us eternally, but His POWER is not opened to us unless we believe. When we allow the wilderness of this world to influence our believing, we fail to see the power of the Spirit. We fail to influence the wilderness around us. We fail to alter the environment around us. Men who believed in the POWER of Christ influenced the environment into which they were placed. Stephen had a profound effect upon those angry men. Paul had an astounding effect upon prisoners, towns people, and even hardened Roman Soldiers. Christians must learn how to “host” the presence of God such that He is always before us, influencing the environment of every place we step into. What we are conscious of, we are positioned to manifest. What we are aware of, we are able to release. If we are not conscious and aware of the POWER of God within us, we will never be able to influence those around us. The Gospel is not a ministry of words. 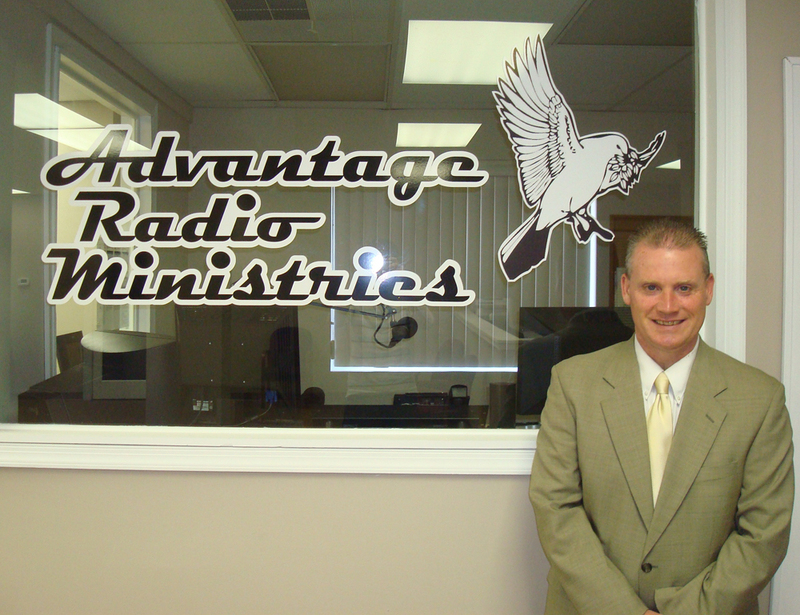 The Gospel is the ministry of Power because of the presence of the Holy Spirit in our lives. 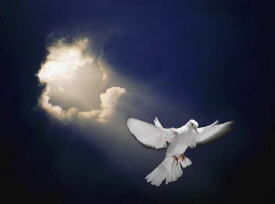 The Gospel is the ministry of releasing the presence of the Holy Spirit in the whole earth. We will never release that which we are unaware of. A woman who had struggled for years with an issue of blood made a “demand” upon Christ. In desperation she reached out among the throng to touch the “hem of His garment.” She made a demand for her life. In spite of all the people pressing around Him, Christ was so aware of the Spirit’s presence that He instantly knew when a demand was made to which the Spirit responded. If we are not intensely aware of the Holy Spirit within our lives, we will have nothing to offer those around us who are desperately seeking power for their lives. They are overwhelmed, they are needy, and we have no life-giving power to offer them. Write a HUGE Check with Heavenly Currency! Peter knew a heavenly currency that the world knows nothing about. Peter wrote a HUGE check because he knew what he possessed (Acts 3:6). Most Christians can only write tiny checks because our unbelief has obscured what we possess. Jesus, being the very logos (word), spoke the Spirit and Life where ever He journeyed. When Christ spoke, His words became the Spirit and brought LIFE to those who believed. When we believe in the Words of Christ, and speak them into the world, we impart the Spirit to our environment, and we impart LIFE to those who believe. We are Kingdom builders through the POWER that is in us. 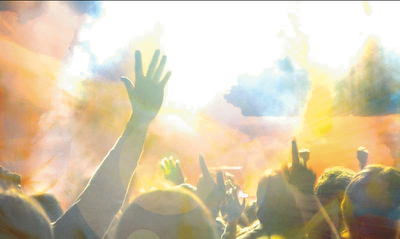 This Kingdom is not in food or drink, but is righteousness, peace and JOY in the Holy Spirit (Romans 14:17). When we are aware of the power that lies within us, and we exercise that power in faith, we are building the Kingdom by bringing people to the LIFE in Christ. 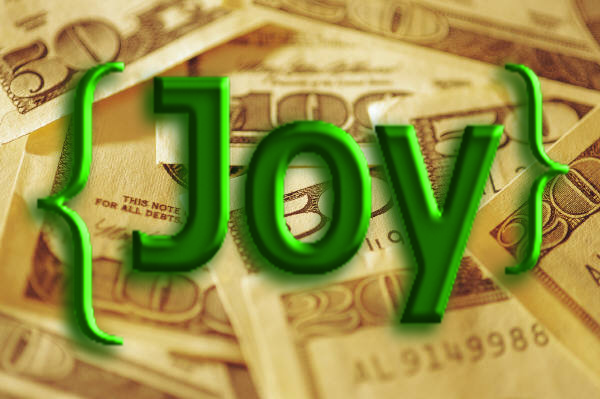 We are dispensing the heavenly currency of JOY to those around us. When you are handing out money, people stop and demand some. When you are handing out JOY, joy that this world is so hungry for, people will stop and demand it. The communities around the disciples took note of what they were handing out. They took note of where they went. They even brought the sick and lame into the streets to catch the shadow of Peter and be healed (Acts 5:15). Note: Your Shadow will always release what overshadows you! Peter was overshadowed by the Holy Spirit! An unbelieving, defeated group of Christians will never see life brought to the dead in sin. They will never see miracles of God. 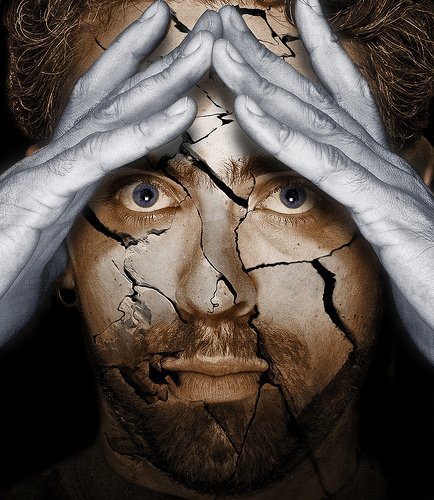 Unbelief and defeat produces inward focused Christians, prone to depression and discouragement. When we turn inward we become a dead sea. An inward focused Christian is a dead Christian. An inward Christian is self-absorbed and self-centered. We need to be pre-occupied with who Christ is! With what Christ can do! We need to constantly release Him into every circumstance we encounter. We release His POWER by faith! So much of “Christianity” is based upon disappointment rather than revelation. We fail to see the Glory of God or the Power of His Son. Stephen saw the revelation in the midst of a downpour of stones. Paul saw the revelation in the midst of a hateful heart. John saw the revelation in the midst of loneliness and exile. The Revelation of Christ changes our environment. It changes our heart! Rather than being disappointed in what God fails to do for us, we need to focus on all that God has done for us! Jesus said that if you see Him, you have seen the Father. So Jesus is the revelation of the nature and power of God. Jesus said that “all power” had been given to him in heaven and on earth (Matthew 28:18). His power is the basis of us going into the world. If we do not know His power by revelation, then we will be powerless if we go into the world. We will be overcome by the world! Powerlessness is inexcusable and unacceptable. The Spirit that raised Jesus from the dead is in you and he wants out. He is not in us as a lake, or a ‘dead sea’, but rather as a river. Rivers flow from. The nature and power of God becomes ours as a believer. We have to believe in our own conversion! We have to believe in the POWER that was given to Jesus and was given to us! As Paul prayed, the Lord is releasing a spirit of wisdom and revelation so that we can actually rise to who He says we are! We cannot afford to rest in unbelief, nor can we afford to think thought that God never thinks about us. We must learn to meditate on the things the Holy Spirit can say “AMEN!” to. Paul wrote that in order to serve God acceptably, our minds (that thing between our ears) must be renewed so that our lives are transformed. Our minds must come under the influence of the Holy Spirit. We must learn divine perspective in order to live the divine life. 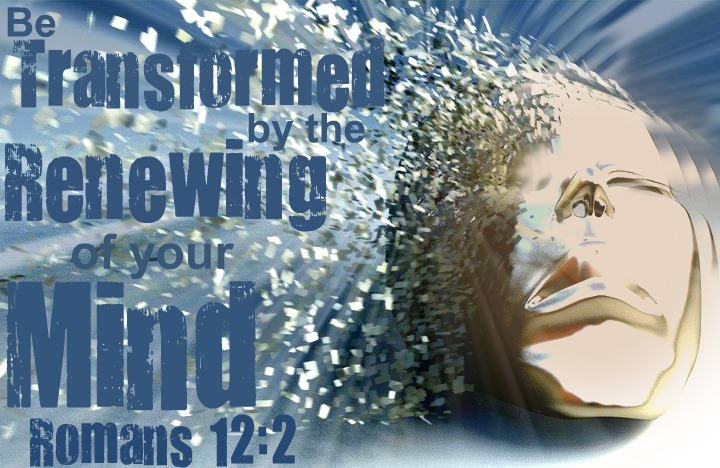 This renewing of our mind can only come from a divine encounter with the POWER of God. We must see the revelation of Christ as the POWER in our life. Any creed or teaching that does not take us to the person of Jesus in a divine encounter will only make us more “religious.” It will only equip us to argue, not bring life into our environment. When our beliefs line up with the POWER of Christ in us, we can take the Gospel into our communities without limits, without baggage that weighs it down and renders it powerless. We must have the experience of the Gospel that changes our lives, changes our thinking and makes us intensely aware of the divine POWER within us. Only then can we dispense the currency of heaven to those joyless souls around us. GraceLife is about Living Life in Jesus Christ, through Jesus Christ and for Jesus Christ. It is not fairy dust sprinkled on you that turns you into a super-Christian. 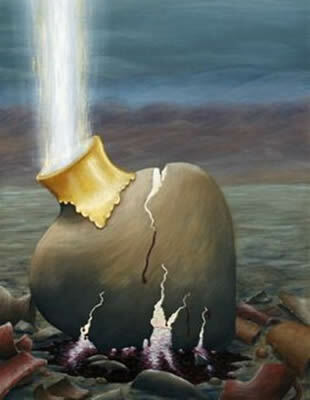 In fact GraceLife becomes the most powerful when we become broken vessels in the potters hand. GraceLife is all about taking human vessels and making them vessels of honor for the Glory of God. As Steve McVey illustrates, GraceLife takes all of us and unites us with the Power of Jesus Christ. 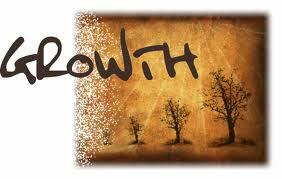 As Christ directs our life, the Holy Spirit must do some pruning, and God must do some disciplining. 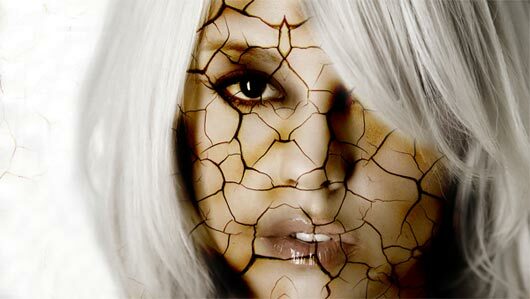 Life and circumstances happen, exposing cracks in our flesh. Don’t try to cover them up or dress them up, for God can use those weaknesses through the power of His grace! Grace is the Power of God that continually transforms our lives as long as our hearts remain soft (humble) toward Him. Grace through Jesus Christ gives the New Covenant the Power that was missing in the Old Covenant. Hebrews 8:8 indicates the problem with the Old Covenant was the Jewish people themselves. Their hearts were of stone, and the Old Covenant provided no power to change those stony hearts. So the Law had no power to free the Jews from slavery to sin and fleshly desires. Hebrews 8:7-10 For if that first covenant had been faultless, there would have been no occasion to look for a second. For he finds fault with them when he says: “Behold, the days are coming, declares the Lord, when I will establish a new covenant with the house of Israel and with the house of Judah, not like the covenant that I made with their fathers on the day when I took them by the hand to bring them out of the land of Egypt. For they did not continue in my covenant, and so I showed no concern for them, declares the Lord. For this is the covenant that I will make with the house of Israel after those days, declares the Lord: I will put my laws into their minds, and write them on their hearts, and I will be their God, and they shall be my people. The New Covenant is empowered by Grace, Grace given at the Cross of Jesus Christ, Grace that gives us new hearts, soft hearts, upon which is written the Word of God, empowering us to live a life pleasing to God. GraceLife is applied to soft hearts and empowers us to live life in union with the Rule-Maker. In fact, Jesus unites with our soft hearts to live this life in His righteousness and power! Is your heart soft toward Jesus Christ and His Word? Are you having trouble believing that God can use your vessel for His glory? Do you think your cracks are too wide or too deep? Jesus loves our cracks, for they give Him an opportunity to work in our lives and show the power of His grace. Ephesians 1:6 To the praise of the glory of his grace, wherein he hath made us accepted (charitoo) [to pursue with grace, compass with favor; to honor with blessings].in the beloved. Jesus Christ pursues you with His grace, encompassing you with His favor and honoring you with His blessings, all because you are His brother/sister, adopted into God’s glorious family of saints. Regardless of how ugly you think your life is, in Jesus Christ you are beautiful, you are handsome, you are a vessel of honor in His hands. It is time you open your heart and eyes in faith and see the power of Grace that is upon your life! Don’t let your sin and failures keep you from realizing who you are to Jesus Christ. In the beginning of 2010 business was great. My business was doing well. God even opened a door to get my church on TV every Thursday night in prime time in over 2 million homes in the Philadelphia market with many people being saved and set free. But life was about to throw me another curve. In May, my largest customer began to bounce large checks and fall behind. Soon he owed us thousands. Next thing I know the state closed down his business. Then my former employer attempted to bring a personal law suit against me. What else could happen? Things were tough! My business was in debt and I had an angry ex employer trying to bring me down anyway he could for things that weren’t true. Finally, after weighing my options, I realized the only way to get myself out of this financial mess and was to declare personal bankruptcy. It was a hard thing to decide. I had a great credit score and never had a late payment on my credit report. But I knew what had to be done. In early 2011 it became public knowledge that it was filed. My former employer learned there’d be no suit due to the bankruptcy and he was angry. He began notifying broadcast outlets who did business with me, customers, and anyone who would listen that I had personally filed. He always gave the impression it was his business to try to hurt me. GraceLife brings Honor to your vessel. You become a quality vessel not because you look good on the outside, not because you appear to be holy and righteous, but because Jesus is inside your vessel, multiplying His grace in your life. We are not talking about how “good” you appear on the outside. We are not talking about how many titles or positions you hold at church. We are talking about whether the Grace of God is actively working in your broken vessel or not. Grace is never passive, but actively pursues us for the pleasure of God. Don’t ever believe that you must try to change yourself to somehow be more worthy of Christ. 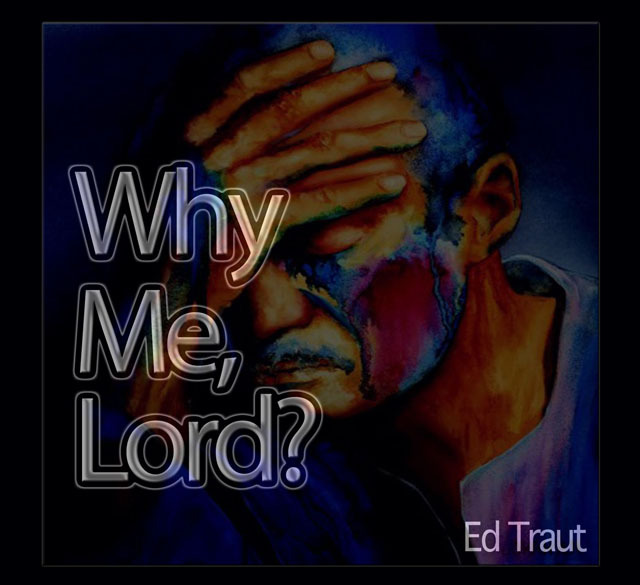 For one, He’s seen worse – Paul was the worst of all sinners (1 Tim. 1:15). Secondly, you can’t do it. Even God’s chosen people rebelled and fell away on countless occasions. Look at Israel in Isaiah… “Jerusalem staggers, Judah is falling; their words and deeds are against the Lord, defying his glorious presence. The look on their faces testifies against them; they parade their sin like Sodom; they do not hide it” (Isa. 3:8-9). These were the people God had called out for His own; they were the ones who were filthy and unclean, lost in their sin. Later the Lord tells them, “In repentance and rest is your salvation, in quietness and trust is your strength, but you would have none of it” (Isa. 30:15). Still, he pursues them! 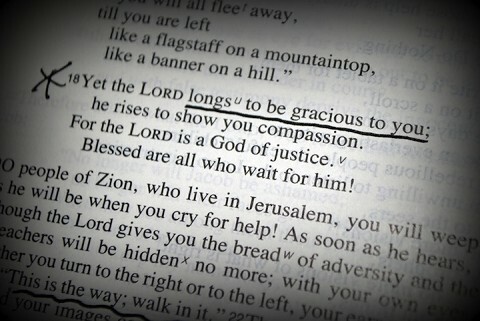 “Yet the Lord longs to be gracious to you; he rises to show you compassion. For the Lord is a God of justice. Blessed are all who wait for him!” (Isa. 30:18). 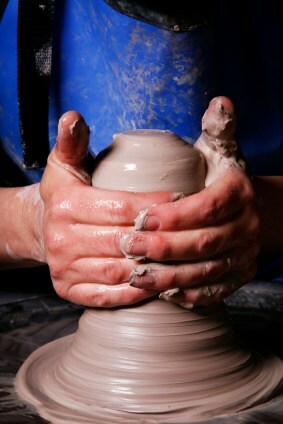 Are you surrendered to the Potter’s hand? Or are you standing proud in your own self-confidence and resistant to His work in your life? Are you bearing up under the circumstances He has you in, or are you running away to an easier place. Is your heart still soft toward Him, or have you allowed it to harden because of the way you have responded to His touch on your life? Are you zealous for God and His Word, or are you apathetic and uninterested? Are you praying for the lost around you, open to the hurting around you, or are you content with your own needs being met? If you are apathetic, ignorant, content, self-centered and unconcerned, you are a vessel that is of no use to the potter, so you are a vessel unto dishonor. You have resisted God’s grace, and your heart has become hard. Your heart has been given over to bitterness, resentment, wrong values, lusts, and even worldly desires. These all harden your heart and block the power of God’s grace. Vessels unto honor have soft hearts, broken hearts, sensitive to the Word and the Holy Spirit. Vessels unto honor realize their own brokenness, so they don’t judge others or condemn others, but administer Grace to all those around them. Vessels unto honor are there for the lost and hurting around them. God never makes a vessel for self-service. We are to benefit each other. Just as Greg Hennis realized. 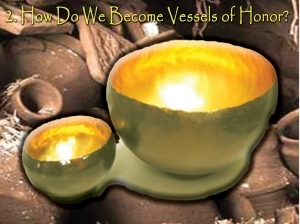 How can GraceLife produce vessels of honor from broken vessels? How can GraceLife produce a church of honor, from a church that is broken? Let’s begin to build a profile of GraceLife. This morning we will look at the “what” of Grace. What does it do for us, and so how will a GraceLife Church appear to an outside observer? Understand first of all that Grace is not some passive gift that occasionally impacts your life. Grace is not a beautiful sunset, or a peaceful walk on a beautiful cool morning. Nor is it a force that suddenly falls upon you as you sit in your easy chair and contemplate life! Grace is an active force that never, never leaves you the same! Grace is the very hand of God nudging you to do His good pleasure. Grace works to ACCOMPLISH God’s pleasure. “Our will does nothing thereunto without grace; but grace is inactive without our will” [ST. BERNARD]. Man is, in different senses, entirely active, and entirely passive: God producing all, and we acting all. What He produced is our own acts. It is not that God does some, and we the rest. God does all, and we do all. “FOR His good pleasure”; in order to carry out His sovereign gracious purpose towards you Ephesians 1:5 Having predestinated us unto the adoption of children by Jesus Christ to himself, according to the good pleasure of his will,. Since Grace accomplishes the pleasure of God, and the pleasure of God is in working loving-kindness, justice and righteousness, we can rest assured that God’s Grace works in our lives to accomplish what God takes pleasure in. 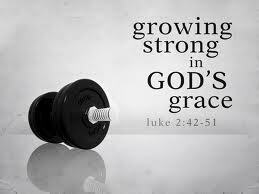 So let’s build a profile of GraceLife, and see where we individually and corporately might be resisting God’s Grace. This word is used 240 times in the Old Testament, and is especially frequent in the Psalms. Is that any surprise since the Psalms were written by a man after God’s Heart. 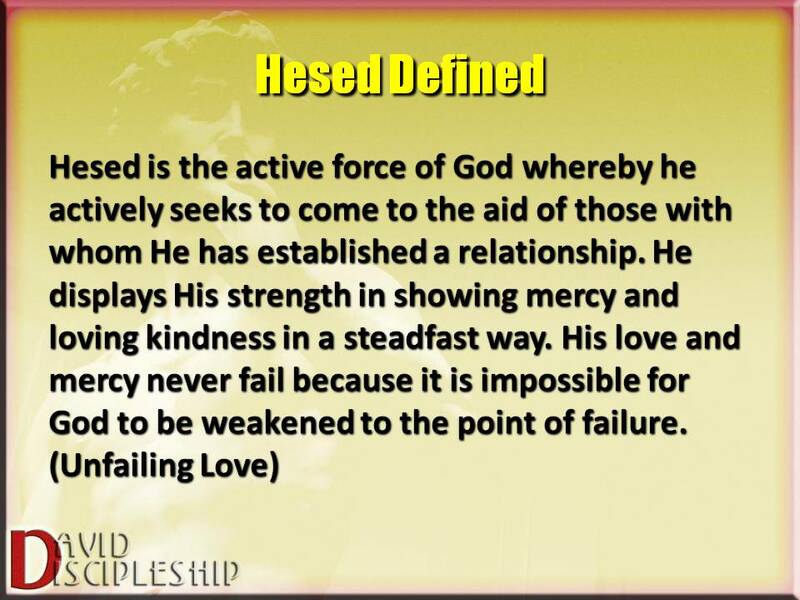 Hesed has three components working together: “strength”, “steadfastness”, and “love”. Take one away and His hesed is not complete. Any understanding of the word that fails to suggest all three inevitably loses some of its richness. Ḥesed implies personal involvement and commitment in a relationship beyond the rule of law. 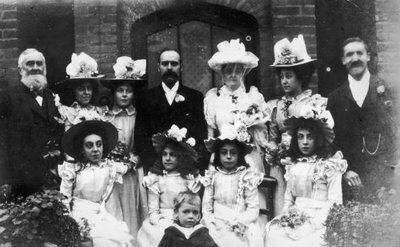 Marital love is often related to hesed. The prophet Hosea applies the analogy to Yahweh’s hesed to Israel within the covenant (e.g., Hosea 2:21). Hence, “devotion” is sometimes the single English word best capable of capturing the nuance of the original. The RSV attempts to bring this out by its translation, “steadfast love”. However, ḥesed is not only a matter of obligation; it is also of generosity. It is not only a matter of loyalty, but also of mercy. Hesed describes God’s devotion to those He has a relationship with. It is an active, seeking love that is based upon strength and resolve. It is devotion of the heart. Hesed comes from the very heart of God! It is His desire for His people! Gives us all Christ’s riches and full acceptance. 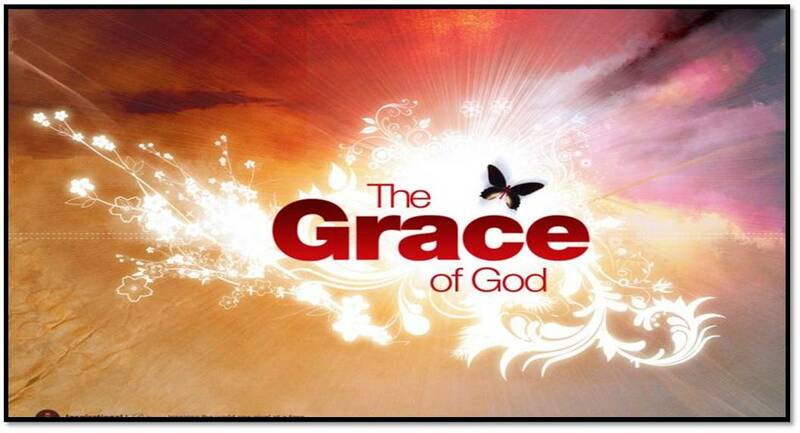 Grace Accomplishes God’s Design of His Justice in our Lives (mishpat). God has a Kingdom in His heart, a kingdom of justice, of order, a kingdom that is at work in heaven and his desire is for it to be so on earth. When His Son came to earth, He did what was necessary to empower this justice on earth. One day He will claim this inheritance and establish God’s Justice on earth. 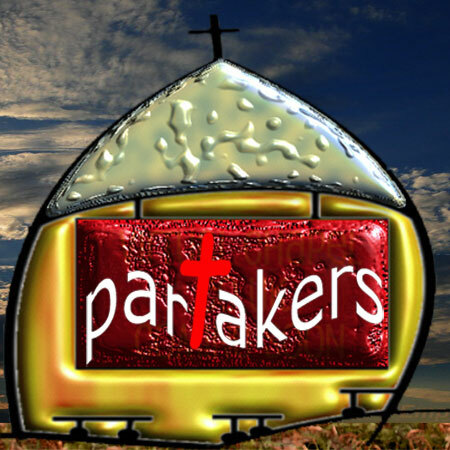 Until that day, we as His children, have an earthly tabernacle in which the Holy Spirit dwells. God can establish His justice in our lives. His Son can reign in our hearts and everywhere our foot trods. Mishpāṭ, as justice, i.e. rightness rooted in God’s character, ought to be an attribute of man in general and of judicial process among them (Psalm 106:37). 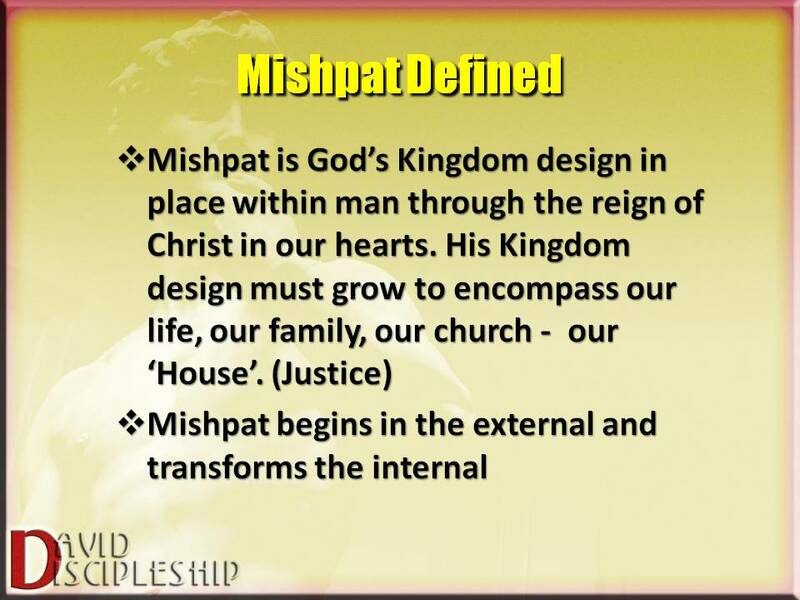 Mishpat expresses the nature of God and the demands of God. He desires His mishpat to reign on earth, and to reign in the hearts of mankind. 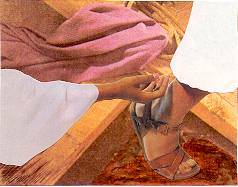 His mishpat is what condemns us; His mishpat is what Jesus Christ satisfied upon the Cross. When God’s mishpat reigns in your heart through faith in Jesus Christ, you stand before God uncondemned. You have standing before God. You have the very ear of God because you delight in the mishpat of Jesus Christ! 1 Corinthians 1:30-31 But of him are ye in Christ Jesus, who of God is made unto us wisdom, and righteousness, and sanctification, and redemption: That, according as it is written, He that glorieth, let him glory in the Lord. We are declared Holy! God re-members our sins no more. He doesn’t take them up again and allow them to hurt Him. They are in a bag slung behind Him and dropped in the deepest part of the ocean where they lay as far as the East is from the West. This is true not only at our ‘new birth’, but true the rest of our earthly life with Jesus Christ. Our sins past, present and future were forgiven at the Cross. Our daily cleansing only thanks Christ for our forgiveness and reestablishes our dependence upon Him for our life. Romans 5:20-21 Moreover the law entered, that the offence might abound. But where sin abounded, grace did much more abound: That as sin hath reigned unto death, even so might grace reign through righteousness unto eternal life by Jesus Christ our Lord. A young lady started attending the church I pastored in Edgerton, KS. It wasn’t long before I learned she was in a bitter divorce and custody battle with her estranged husband. He had succeeded in turning her former pastor and congregation against her. She shared how she sang on the praise team. I encouraged her to sing at our church, but I could see that she had lost her “song” for the Lord because of the struggles she was facing. I told her she was welcome at our church, even though her ex-pastor told me I should not let her worship at our church. Together we looked at the Scriptures, and God’s Word opened up God’s wonderful grace to her broken life. Within eight months she came to me and said she felt like singing. Oh what a wonderful voice she had. Her songs were powerful and life-giving, because they came from a broken vessel transformed by the grace of Jesus Christ. Have you really messed up? Is your vessel pretty broken up and useless? Do not despair, do not be cast down. Jesus can take the broken pieces of your life and make them honorable, useful and beautiful. He will give you a Song in your heart, the song of the matchless grace of Jesus! Spiros Zodhiates, The Complete Word Study Dictionary – New Testament, (Chattanooga, TN: AMG Publishers, 1993), WORDsearch CROSS e-book, 1471. Jamieson, Robert, Fausset A.R. and Brown, David; 1871,The Commentary Critical and Explanatory on the Whole Bible.